As a visual artist I am constantly intrigued painting the abstract qualities of water. The surface of water creates reflected and refracted imagery, hinting at the surrounding environment is broken by the movement of water with its shapes, patterns and colors that swirl into and out of each other creating fascinating abstract imagery. I am inspired by close-up imagery water capturing a moment of time as the water is stopped in itʼs movement. The paintings viewed close-up portray the abstract imagery of shapes and patterns, but viewed from a distance the imagery of water and movement becomes apparent to the viewer. The water paintings also tell a story. They allude to a metaphor of the human experience as we experience life through the ideas of the ripple effects in water and how ripple effects affect our life. Or the idea of what lies beneath the surface in water and in ourselves. 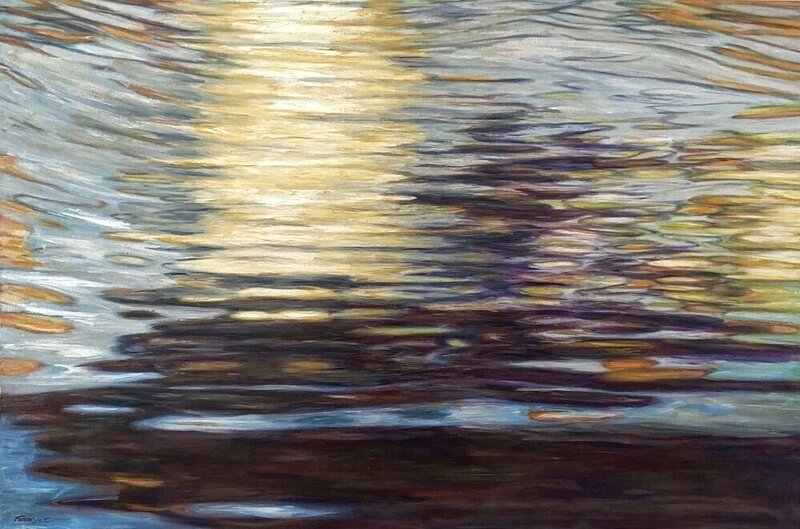 Water alludes to tranquility as the viewer becomes mesmerized in the reflected movement. The paintings are meant to give importance to the element of water so vital to our existence but so often taken for granted or wasted. Inspiration and reference for these paintings has come from the Colorado River. The paintings are way to highlight the beauty and importance of water as the river is heavily impacted by demands for it’s water continue to grow.